Last week I went to a Realtor party for the opening of the new condo Bisha Hotel and Residences located on Blue Jays Way just south of King. This new condo will be built where the old Diesel Playhouse is. I can truly say this was no ordinary condo opening party. 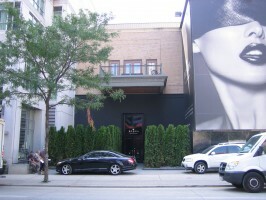 As I approached the sales center from a distance it looked as though there was a tiff event going on. There was a red carpet and a line up of dressed up ladies holding what looked like a guest list. Was this a club event or a condo party? If the Bisha condo will be anything close how this party was presented, I will be VERY impressed! All I can saw is WOW… what a party! Bisha Condo will be 41 Storeys high with the architecture by Wallman Architects. Interior design by Munge Leung. Bisha condo suites will feature 9′ exposed concrete ceilings, double glazed windows, engineered floors in all principle rooms and bedrooms, contemporary kitchen cabinetry and island, stainless steel sink and appliances. Resdients dont have to worry about having the midnight cravings as there will be a24hr cafe/bar located in the condo building. A private lounge/club with a caterers kitchen will be available for party’s. On the 41st floor, residence can enjoy the use of the rooftop restaurant, lounge, infinity pool and cabana style seating. Feels like a vacation! Studios start at 379 sq ft.
1 Bedrooms start at 514 sq ft.
1 Bedroom + dens start at 559 sq ft.
2 Bedroom + dens start at 944 sq ft. Parking is $45,000 ( on select suites only). Locker is $3,800 ( on select suites only). Contact me below for Bisha Condo prices and floor plans.